Mother's Day is just around the corner so how about something a little sweet and a little sassy for the mom in your life? 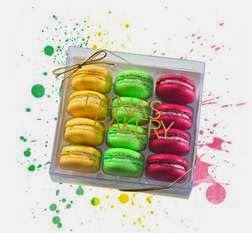 Dana's Bakery offers traditional French macaroons in fun American flavors. Like the Mother's Day inspired "Adult Juice" box. This beautiful gift box includes 3 different cocktail inspired flavors including; Mint Julep, Mojito and Cosmo. These sound and look so delicious! I don't know about you but I would love to receive these as a Mother's Day gift. If cocktails are not moms thing, no worries, check out the other flavors currently available at Dana's Bakery. When you sign up for their newsletter you will receive an email to save 10% on your order.